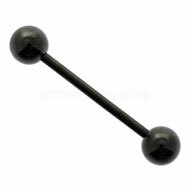 Eye brow barbells are a special type of small, curved barbell that is especially designed for eyebrow piercings. Eyebrow bars are actually a type of bananabell – they are the same shape, only much smaller. 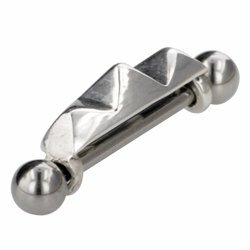 Most eyebrow piercings are done with a curved needle, so you will probably find it more comfortable to wear a curved barbell in your eyebrow piercing. You can find eye brow barbells in a huge range of designs and funky colours. This makes it easy to make a statement, keep your piercing looking subtle or update your look. 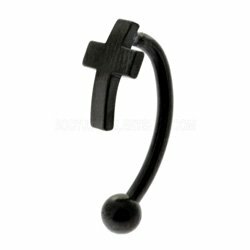 In this post I have outlined some of the most popular types of eye brow barbell but the choice is endless â€“ as long as itâ€™s the right size you can wear ANY eye brow barbell in your piercing. 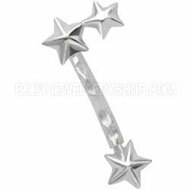 Steel eye brow barbells are cheap and come in lots of designs, making them a popular choice for most people with an eyebrow piercing. 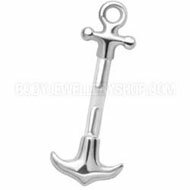 These eye brow barbells are made from surgical steel and for the best fit, always make sure your steel eyebrow bar is made from 316L surgical steel. 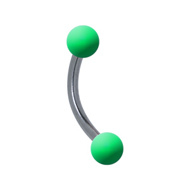 This type of steel is of superior quality and less likely to irritate your skin. 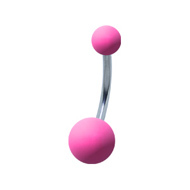 This entry was posted in Eyebrow Piercings, Surgical Steel Body Jewellery, Titanium Body Jewellery and tagged Body Jewellery, Eyebrow Bar, Eyebrow Barbells, Eyebrow Piercing, Eyebrow Piercings, Eyebrow Stud on March 3, 2010 by Piercing Guru.